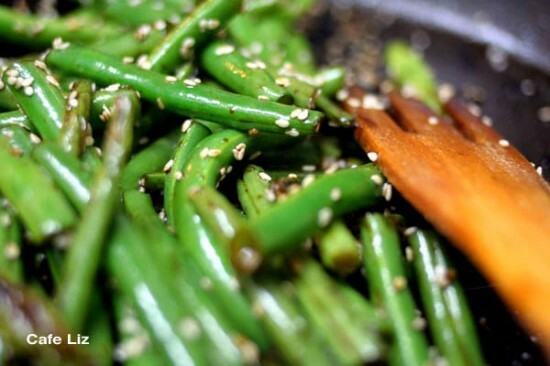 Here’s another simple dish — pan-fried green beans with soy sauce and sesame seeds. I used super-fresh green beans we’d bought earlier that day at the market, and seared them on high heat so they’d be slightly blistered on the outside but still crispy and bright green (when they’re so fresh, you don’t want to overcook them). So here goes: You’ll need green beans (I used about 200 grams, which makes a small side dish for two people), about one tablespoon sesame oil to grease the pan (or canola if you don’t have any), a few tablespoons of soy sauce, about a teaspoon of date honey (or brown sugar if you don’t have any) and a few tablespoons of sesame seeds. Trim the tips off your green beans and slice them in half, so they’re a manageable length. Oil a frying pan with the sesame oil, and stick it on a high flame, with the green beans. Stir only occasionally — you want to give the green beans a chance to sear slightly, so they’ll have browish-black blisters. When the green beans are bright green and as blistered as you want them to be, turn off the flame and add the soy sauce (I used about 3 tablespoons) and the date honey, and mix well — the pan is hot enough that the liquids will boil off almost immediately. Pour on the sesame seeds, enough so that the green beans have a nice sesame-flecked coating. That’s it! 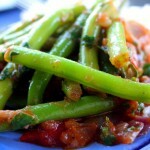 5 Responses to "Green beans in soy sauce and sesame"
I make this with lots of garlic. Also, since fresh green beans are rare to find and trouble to work with, I usually use frozen green beans, which of course have to be cooked briefly before searing. 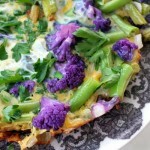 There are lots of great alternatives when it comes to green beans. I generally can find them at the Carmel market, and yeah, it’s a pain to remove all the tips. 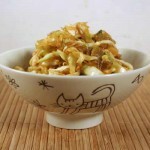 Just tried your recipe – delicious! And that’s a great job you’re doing taking photos – I wish I could have mine come out like that. Quick question – is coconut milk kosher? Hi Coconut, there’s nothing intrinsically unkosher about coconut milk. So yes, it could be kosher, but many observant Jews may insist on buying coconut milk from a producer who has official kashrut status. don’t understand this, its part and parcel of good food, i sit with my sons and we chatter about non-sense clipping the tips off with our fingers. Nothing like these precious moments, not unlike my own childhood. I use alot of garlic stir frying these babies, sometimes ginger depending on my mood. The silan is a nice touch will try it next time thanks!